Eighteen years ago this month, TableWine posted its inaugural feature, Perfect Wines for Pizza. We chose the topic because pizza seemed to epitomize everyday fare and we wanted to make it clear, from the outset, that our focus would be on affordable wines for everyday drinking. We published quite successfully until 2003, at which point I began working in the wine industry and thought it best to give up the site to avoid any conflicts of interest. After retiring last July, however, I thought it was time to bring TableWine back as a blog. Back then in ’96, it seemed that most wine websites and newsgroups were targeting the connoisseur or the oenophile. Readers exchanged views and tasting notes on old Bordeaux and Burgundy or regaled one another about their latest coups in securing 90-point California Cabernets. But, I thought, how many people (even those who can afford them) actually drink First Growths or Grand Crus on a daily basis? Far more, I was sure, sit down to a weekday meal with a bottle that was on special at their favorite wine store, or with a glass of their own house red or white that they pick up every week at the supermarket. That’s our audience, I thought, and so began TableWine.com and focused on wines that were $20 or under. But before I wax overly nostalgic, let’s turn to the subject of this month’s feature: pizza wines. A good bottle can pick up even the most mundane pie. Choosing a wine for pizza can depend a lot on what you like about this Italian staple. If you’re a crust fancier, you’ll want a wine that tones down the sauce and toppings and brings out the baked flavor of the crust. If you’re a toppings nibbler (we’ll limit our discussion to cheese, pepperoni, and mushrooms—no gourmet fare), select a wine with enough acidity to stand up to the sauce and just enough flavor to complement your topping. But if, like many of us, you think the whole pizza is greater than the sum of its parts, you want a wine that will counterpoint the blend of bread, tomato, and topping. For this tasting, we visited a couple of local wine stores and chose wines that have a wide distribution and that we thought would go well with pizza. The pizzas were from a local pizzeria; no gourmet specialty fare, just three large pies, one with cheese, one with mushrooms, and one with pepperoni. As is our custom, we first tasted the wines on their own without any food and then with the food. The wines are listed in the order in which they were tasted, which was determined by their alcohol level. Please suggest your favorite wines for pizzas as comments to this post. 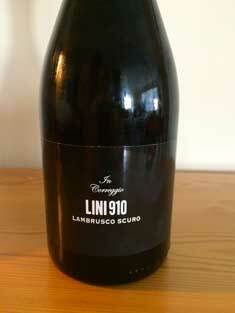 Deep purple in color, this frizzante dry Lambrusco has an earthy nose, with berry and black-fruit notes. Medium-bodied, it’s packed with blackberry flavors that culminate with a lingering fruit finish. Its effervescence makes it a refreshing accompaniment for pizza. “Gulpable,” commented one taster. It went best with the pepperoni pizza. This Tuscan blend of Sangiovese (85%), Merlot (10%), and Cabernet Sauvignon (5%) reflects Sangiovese’s characteristic pale ruby color with garnet hues. The nose is characterized by earth and leather. It has good body, with balanced acidity. It finishes with mineral chalk notes. An austere Tuscan blend. Although adequate with the pizza, we all thought this wine would pair better with meat. This California blend of Zinfandel, Cabernet Sauvignon and Syrah is deep ruby in color. On the nose, there are hints of cinnamon, red berries, and earth. Medium bodied, the wine’s bright cherry flavors are complemented on its long finish by tart-berry notes. 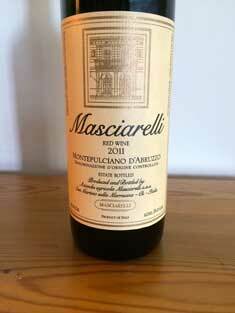 This wine was outstanding with the pizza and we considered it the “star” of this tasting. Deep ruby-red in color, this wine has a an alluring nose of burnt sugar and black fruit. Light to medium bodied, it offers cherry-candy, though not cloying, flavors. It’s well structured with lingering cherry notes on the finish. This wine went better with the mushroom pizza than with the others. Dark ruby in color, with aromas of leather, smoke, and black pepper, this French classic is medium bodied and structured with supple tannins and good acidity. It offers spice and mineral flavors reminiscent of white pepper and chalk along with hints of tart fruit. It has good length and some caramel notes on the finish. This is definitely a food wine and it went well with the pizzas, especially with the pepperoni. Dark maroon in color, this California zin is more about spice than fruit. The nose is spicy and earthy. On the palate, it’s full bodied with a silky mouthfeel and delivers dark-fruit and licorice flavors. It has a lingering finish with notes of blackberry and pepper. Although quite good on its own, we thought it overpowered the Margherita and mushroom pizzas.